Help pre-teens and teens navigate the transition years. 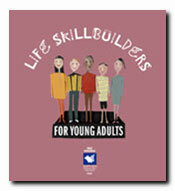 Written and designed exclusively for early, mid and late teens, Life SkillBuilders for Young Adults is a collection of facts, quizzes and worksheets to help young people understand the changes in their life and prepare for adulthood. This book is ideal for counseling, structured group exercises or as an activity workbook. Growing Up: What Does It Mean? Asserting Yourself: How Do You Score? Conflict Resolution: What's Your Style? Planning Ahead: College, Trade School or Work? Career Choices-What Do I Want to Be?